People living with chronic obstructive pulmonary disease (COPD) are often prescribed a bronchodilator, a type of medication used to relax the air passages to help you breathe better. 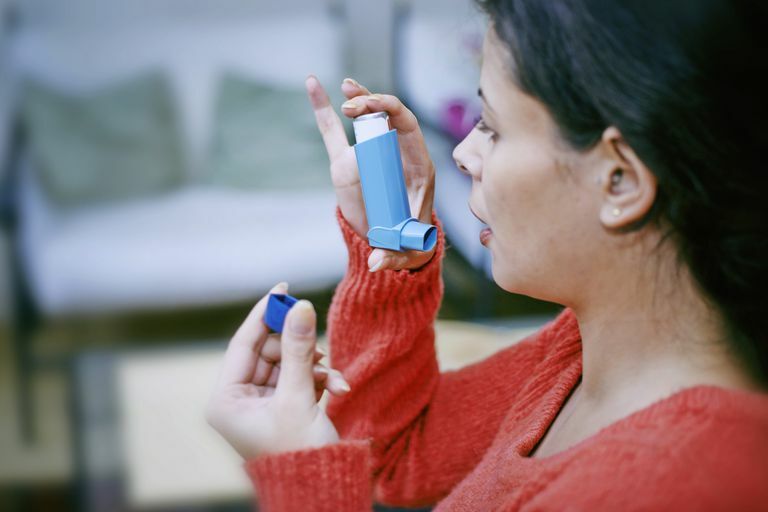 The medications are typically inhaled through the mouth using a metered dose inhaler (MDI) but are also available in liquid, pill, injectable, or suppository formulations. Beta-adrenergic agonists (also known as beta-agonists) are a type of medication that binds to specific receptors in the lung called beta-adrenoceptors. By doing so, they block the trigger to bronchial spasms and allow airway passages to open. Beta-agonists can either be short-acting (lasting four to six hours) or long-acting (lasting 12 or more hours). They are delivered either orally or through an MDI. The inhaled method is generally preferred as it alleviates symptoms faster. Beta-agonist medications are also used in two-in-one formulations such as Symbicort which combines formoterol with an inhaled corticosteroid known as budesonide. Drug side effects are usually dose-related and more commonly seen with oral use. The most common include rapid heart rate (tachycardia), heart palpitations, tremors, and sleep disturbance. Anticholinergics are medications that block a type of neurotransmitter known as acetylcholine. Parasympathetic nerves (those associated with automatic function) are the primary source of acetylcholine in the lungs. By blocking the production of these substances, the contractions and spasms in the airways are effectively stopped. Anticholinergics are only available in an inhaled form and offer excellent bronchodilation with minimal side effects. Anticholinergics are particularly useful for those who cannot use beta-agonists or methylxanthines due to underlying heart disease. There is also a combination inhaled formulation called Combivent which contains ipratropium and the short-acting beta-agonist albuterol. The most common side effects of anticholinergic drugs are dry mouth and a metallic aftertaste. In rare cases, glaucoma has been known to occur. Methylxanthines are a unique class of drug known to alleviate airflow obstruction, reduce inflammation, and temper bronchial contractions. Their mechanism of action is not well understood, and, while effective, the drugs are not commonly used in first-line treatment due to their range of side effects. Methylxanthines are most appropriate for persons who are unable to achieve adequate control with either beta-agonist or anticholinergic drugs. Unlike the other types of COPD bronchodilators, methylxanthines are not inhaled. They are currently available in either pill, liquid, intravenous, or suppository formulations. The side effects can sometimes be profound, especially if delivered intravenously. Symptoms may include headaches, insomnia, nausea, diarrhea, jitteriness, rapid breathing, and heartburn. Call your doctor immediately if you experience vomiting, irregular heartbeat (dysrhythmia), or seizures. Vestbo, J.; Hurd, S.; Agusti, A. et al. "Global strategy for the diagnosis, management, and prevention of chronic obstructive pulmonary disease: GOLD executive summary." Am J Respir Crit Care Med. 2013; 187(4):347-65. DOI: 10.1164/rccm.210204-0596PP. How Can Expectorants Help Your COPD?